SEDGWICK — This week, Blue Hill Heritage Trust was awarded $200,000 by the Land for Maine’s Future program, toward the purchase and conservation of a key piece of property on Caterpillar Hill, in Sedgwick. 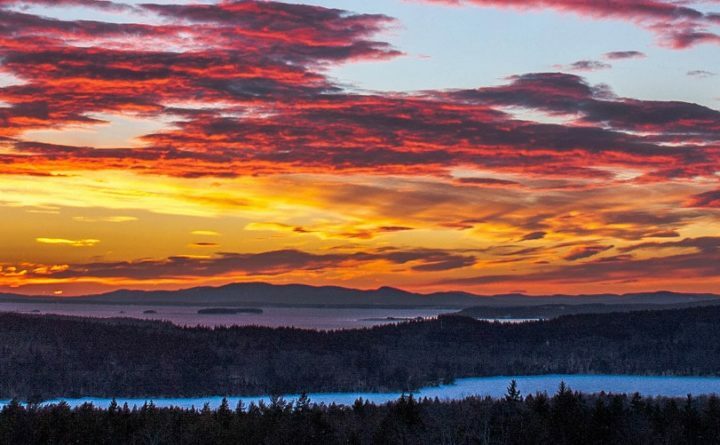 The collaborative fundraising effort, by Blue Hill Heritage Trust, Maine Coast Heritage Trust, and Island Heritage Trust, will protect another key portion of the iconic view out across Penobscot Bay and the islands. It will also increase public access to trails, as well as boating and swimming on Walker Pond. The Sedgwick Select Board noted, in its letter of support to LMF, that “protection of Caterpillar Hill as a landmark, and a place for residents to enjoy, was solidly the number-one priority,” in a town-wide survey concerning priority places. BHHT is very happy to have this community support, and to work with the town in meeting this shared goal. The Trust’s application to the Land for Maine’s Future program was sponsored by the Maine Department of Agriculture, Conservation, and Forestry, Bureau of Parks and Land, which recognized the importance of protecting the view and increasing access to Walker Pond. The project has also received full support from other area towns and businesses, which see this place as central to local memory and identity, as well as tourism. Over the past 30 years, Land for Maine’s Future has helped conserve over 600,000 acres in Maine, now available for public enjoyment. Since 1987, Maine voters have overwhelmingly approved five separate bonds that have provided funds to support the conservation of lands with significant recreation and conservation values. Previous LMF funding rounds have been instrumental to the success of local conservation projects by all three of the collaborating partners on this project. Maine Coast Heritage Trust is a statewide land conservation organization dedicated to protecting land that is essential to the character of Maine, its coastline and islands in particular. Since 1970, more than 144,000 acres and 300 entire coastal islands have been permanently protected. For more information, contact Ciona Ulbrich, Senior Project Manager, at 207-244-5100, or visit www.mcht.org. Island Heritage Trust Island Heritage Trust is a community-based, non-profit land trust contributing to the well-being of the island community by conserving its distinctive landscape and natural resources, maintaining public access to valued trails, shoreline and islands, and by providing educational programming for all ages. For more information contact Mike Little, Executive Director, (207) 348-2455, or www.islandheritagetrust.org.